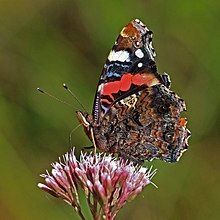 Vanessa atalanta, the reid admiral, is a well-kent colourfu butterflee, foond in temperate Europe, Asie an North Americae. The reid admiral haes a 45–50 mm (1.8–2.0 in) weengspan. This page wis last eeditit on 14 Februar 2018, at 19:09.